As with the G-LISA and Pull-Down Activation Assays, the PAK-PBD, GGA3-PBD, Rhotekin-RBD, and Raf-RBD bead conjugates are useful tools to separate the active form of small G-proteins from cell lysates. PAK beads are ideally suited for Cdc42 and Rac1 studies whereas GGA3 is specific for Arf1 and Arf6, while Rhotekin is specific for Rho and Raf-beads are specific for Ras sub-family members. 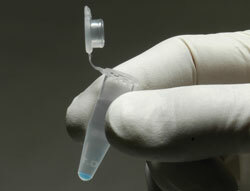 The protocols (including lysis buffer formulation) for using the beads are described in the datasheets below. The beads are also flexible with respect to using them for multiple isoforms of Rac or Rho; just use a specific antibody for the isoform of interest (e.g., a RhoC antibody to look at active RhoC instead of RhoA or B). The beads are also colored (a Cytoskeleton innovation in 2004) to easily identify pellet material. For more information, click on the datasheet below. Cytoskeleton's products have been cited hundreds of times over the past 18 years. A select few are described here, for more citations on individual products please use the "Citations" tab on each individual product page. Scott, G., Leopardi, S., Printup, S. and Madden, B. C. (2002). Filopodia are conduits for melanosome transfer to keratinocytes. J. Cell Sci. 115, 1441-1451. Bi, Y. and Williams, J. A. (2005). A role for Rho and Rac in secretagogue induced amylase release by pancreatic acini. Am. J. Physiol. 289, C22-33. Borm, B., Requardt, R. P., Herzog, V. and Kirfel, G. (2005). Membrane ruffles in cell migration: indicators of inefficient lamellipodia adhesion and compartments of actin filament reorganization. Exp. Cell Res. 302, 83-95. Wang, S. E., Wu, F. Y., Shin, I., Qu, S. and Arteaga, C. L. (2005). Transforming growth factor β (TGF-β)-Smad target gene protein tyrosine phosphatase receptor type kappa is required for TGF-β function. Mol. Cell. Biol. 25, 4703-4715. Saito, S., Liu, X. F., Kamijo, K., Raziuddin, R., Tatsumoto, T., Okamoto, I., Chen, X., Lee, C. C., Lorenzi, M. V., Ohara, N. et al. (2004). Deregulation and mislocalization of the cytokinesis regulator ECT2 activate the Rho signaling pathways leading to malignant transformation. J. Biol. Chem. 279, 7169-7179. Autieri, M. V., Kelemen, S. E. and Wendt, K. W. (2003). AIF-1 is an actin-polymerizing and Rac1-activating protein that promotes vascular smooth muscle cell migration. Circ. Res. 92, 1107-1114. Chiang, S. H., Hwang, J., Legendre, M., Zhang, M., Kimura, A. and Saltiel, A. R. (2003). TCGAP, a multidomain Rho GTPase-activating protein involved in insulin-stimulated glucose transport. EMBO J. 22, 2679-2691. Zhang, J., Anastasiadis, P. Z., Liu, Y., Thompson, E. A. and Fields, A. P. (2004). Protein kinase C (PKC) βII induces cell invasion through a Ras/Mek-, PKC ι/Rac 1-dependent signaling pathway. J. Biol. Chem. 279, 22118-22123. Ishii, S., Kihara, Y. and Shimizu, T. (2005). Identification of T cell death-associated gene 8 (TDAG8) as a novel acid sensing G-protein-coupled receptor. J. Biol. Chem. 280, 9083-9087. Wang, Q., Liu, M., Kozasa, T., Rothstein, J. D., Sternweis, P. C. and Neubig, R. R. (2004). Thrombin and lysophosphatidic acid receptors utilize distinct rhoGEFs in prostate cancer cells. J. Biol. Chem. 279, 28831-28834. Zhang, X. F., Schaefer, A. W., Burnette, D. T., Schoonderwoert, V. T. and Forscher, P. (2003). Rho-dependent contractile responses in the neuronal growth cone are independent of classical peripheral retrograde actin flow. Neuron 40, 931-944. Question 1: What is the best way to measure all activated Rho isoforms in my samples using the pull-down method? Answer 1: The RhoA pull-down activation assay (Cat. # BK036) utilizes rhotekin-RBD beads to capture the activated (GTP-bound) RhoA, RhoB and RhoC proteins. 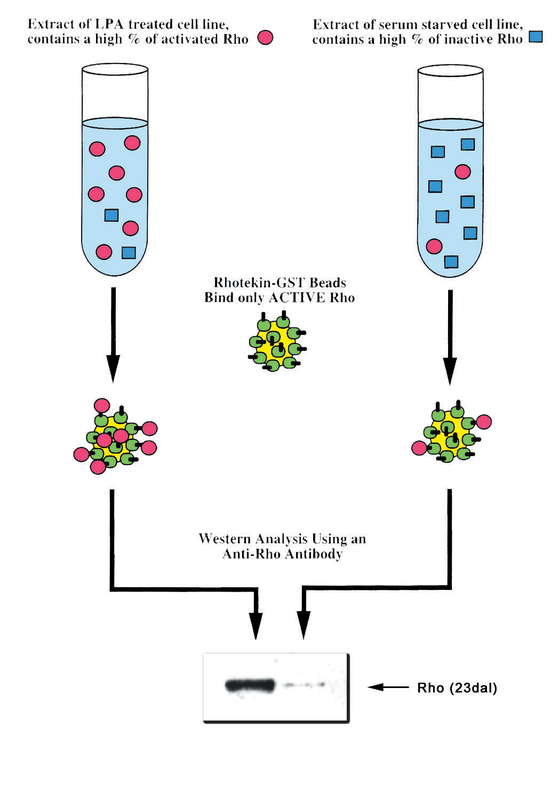 Active RhoA levels are measured by virtue of the specific anti-RhoA antibody used (Cat. # ARH03). To measure all isoforms, either specific antibodies to each isoform must be used with lysate samples or a pan-Rho antibody that does not recognize individual isoforms should be used to probe the lysates using SDS-PAGE and western blotting. Question 2: How many beads or PAK protein do I need per assay? Answer 2: We recommend performing a bead titration experiment using serum-starved control and treated extracts to identify the optimal concentration of beads to be used for any given GTPase activation or inactivation assay. For rhotekin-RBD beads (Rho activation), the beads will bind to Rho-GDP with a much lower affinity than Rho-GTP. If too many rhotekin-RBD beads are added to the pull-down assay, there will be significant binding to inactive (GDP-bound) RhoA. The result of this will be an under-estimatation of RhoA activation. Once optimal conditions have been established, bead titrations should no longer be necessary. We recommend 25, 50 and 100 μg bead titrations. For PAK-PBD beads (Cdc42 or Rac activation), PAK-PBD will bind to Cdc42- or Rac1-GDP with a much lower affinity than Cdc42- or Rac1-GTP. If too many PAK-PBD beads are added to the pull-down assay, there will be significant binding to inactive (GDP-bound) Cdc42 or Rac1. The result of this will be an under-estimatation of Cdc42 or Rac1 activation. For this reason we highly recommend performing a bead titration to determine optimal conditions for any given Cdc42 or Rac1 activation or inactivation assay. Once optimal conditions have been established, bead titrations should no longer be necessary. We recommend 10, 15 and 20 μg bead titrations.